Bloomberg's Initiative to Reduce Tobacco Use, which was established in 2005 and includes a $125 million commitment, will be extended with a new $250 million, four-year commitment. This brings Bloomberg's total commitment to date to more than $375 million. The Bill & Melinda Gates Foundation announced that it will invest $125 million over five years to fight the tobacco epidemic, including a $24 million grant to the Bloomberg Initiative. In addition to the grant to Bloomberg, the Gates Foundation will support complementary efforts to reduce high rates of tobacco use in countries such as China and India, as well as to help prevent the tobacco epidemic from taking root in Africa. 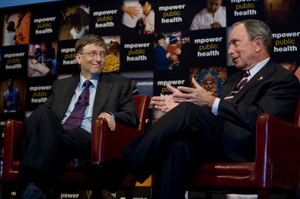 NEW YORK -- Michael Bloomberg and Bill Gates today announced joint efforts to combat the global tobacco epidemic. A combined investment of $500 million will help governments in developing countries implement proven policies and increase funding for tobacco control. Unless urgent action is taken, as many as one billion people this century—more than two-thirds in the developing world—could die from tobacco-caused illnesses. Paula Johns, executive director of Brazil's Alliance for the Control of Tobacco Use, and broadcast journalist Charlie Rose joined Bloomberg and Gates for the announcement. The Bloomberg Initiative supports projects that increase tobacco tax, change the image of tobacco, protect nonsmokers from exposure to other people's smoke and help people quit. The Initiative supports the public sector's efforts to educate and advocate for change, and a rigorous tobacco use and policy monitoring system. The Gates Foundation funding to Bloomberg will accelerate implementation of the MPOWER package of proven tobacco control strategies and build economic evidence to support tobacco control over the next two years. "When I announced this initiative, I said that I hoped others would step forward," said Bloomberg. "I'm delighted Bill and Melinda Gates are supporting one of the most important public health efforts of our time. Our commitments will help governments confront the tobacco epidemic by implementing the proven MPOWER package. This means assuring well-staffed tobacco control programs, raising tobacco taxes, running hard-hitting public information campaigns, creating comprehensive smoke-free public places and banning tobacco advertising." "Tobacco-caused diseases have emerged as one of the greatest health challenges facing developing countries," said Bill Gates, co-chair of the Gates Foundation. "The good news is, we know what it takes to save millions of lives, and where efforts exist, they are working. We are pleased to join with Mayor Bloomberg, who has made the fight against tobacco a priority in New York City and around the world." Bloomberg and Gates called on government and business leaders to make the fight against tobacco a higher priority by increasing resources for tobacco control and implementing proven policies to reduce tobacco use. According to the World Health Organization, 3.9 billion people live in low-and-middle-income countries that spend less than $20 million dollars per year combined on tobacco control. Today, these same countries collect more than $66 billion in tobacco taxes. 24 states (including New York and Washington states) and the District of Columbia now have laws in effect that require 100% smoke free restaurants and bars. Uruguay, UK, France, New Zealand, Italy and Ireland are all smoke-free. Cities such as Mexico City, Mexico; Abuja, Nigeria; Beijing, China; and other Olympic cities are implementing smoke-free laws and regulations. Uruguay, Turkey and other countries are implementing the comprehensive tobacco control policies of the MPOWER package. Egypt has recently raised its tobacco tax. Brazil and other countries are using graphic pictorial warnings on cigarette packs to warn the public about the dangers of smoking. The Philippines has enacted a ban on tobacco advertising in all forms of mass media. Earlier this year, Bloomberg and World Health Organization Director-General Margaret Chan released the U.N.'s evidence-based MPOWER package to help governments adopt the most effective measures to counter tobacco use. Although MPOWER has been proven to rapidly decrease tobacco use and save lives in New York City and elsewhere, less than 5 percent of the world's population is covered by any of the MPOWER interventions. "Bill and I want to highlight the enormity of this problem and catalyze a global movement of governments and civil society to stop the tobacco epidemic," said Bloomberg. "We challenge governments to show leadership by implementing tobacco control measures, as an increasing number are doing, and to increase funding for these efforts." There are more than 1 billion smokers in the world today (more than 1 in 4 adults), and tobacco kills more people than any other single agent. Smoking kills half of smokers unless they quit, and many more are disabled by tobacco. Those killed by tobacco lose on average 10-15 years of life. Second-hand smoke causes lung disease, cancer, low birth weight and increased infant death as well as other problems in those exposed. More than 5 million people are killed by tobacco each year – more than AIDS, tuberculosis and malaria combined. In this century, unless urgent action is taken tobacco could kill more than 1 billion people. More than 80 percent of the world’s tobacco-related deaths will be in low- and middle-income countries by 2030. The poorest households in Bangladesh spend almost 10 times as much on tobacco as on education. Medical costs from smoking impoverish more than 50 million people in China; with 350 million smokers – a third of the world’s total – China suffers about a million deaths from tobacco each year. Indonesians spend on average 2.5 times more on tobacco than on education, and 3.2 times more on tobacco than on health. Traditionally viewed as unacceptable practice, smoking among Indonesian women is now seen as modern and trendy, especially in large cities. India's toll of premature, tobacco-related deaths is expected to rise from 700,000 annually to 930,000 by the year 2010, with bidis currently accounting for 77 percent of the market for smoked tobacco. Studies indicate that bidi smokers are five to six times more likely to develop lung cancer than nonsmokers. The effectiveness of tobacco control interventions is well established by rigorous scientific studies; implementing proven programs can reduce smoking rates where they are high and prevent an increase where rates are low. The Bloomberg Initiative to Reduce Tobacco Use supports public sector and civil society efforts to implement proven strategies in tobacco control in low- and middle-income countries, particularly China, India, Indonesia, Russian Federation and Bangladesh. The Bloomberg Initiative supports training programs, journalism workshops, in-country development of mass media public education campaigns, capacity building and global monitoring through a WHO report on country-specific tobacco control policies and a population-based, house-to-house adult survey of tobacco use prevalence. One aspect of the Bloomberg Initiative is to provide tobacco control funds to low- and middle-income countries through a competitive grants program (http://www.tobaccocontrolgrants.org/); more than 125 grants have been awarded in 36 countries. The Bloomberg Initiative to Reduce Tobacco Use is implemented though five partner organizations: the Campaign for Tobacco Free Kids, the Centers for Disease Control and Prevention Foundation, the Johns Hopkins Bloomberg School of Public Health, the World Health Organization and the World Lung Foundation. New York City's tobacco control program has included raising the tobacco tax, making virtually all workplaces smoke-free, running hard-hitting public education campaigns, helping smokers quit and rigorously monitoring smoking rates and program results. For the 10 years before New York City's program was implemented, there was no decrease in smoking rates. Between 2002 and 2007, under Bloomberg's leadership, New York City's comprehensive program reduced adult smoking by 300,000 smokers, from 21.6% to 16.9%, preventing 100,000 deaths in years to come. Teen smoking decreased from 17.6 percent in 2001 to 8.5 percent in 2007, a level nearly two-thirds lower than the latest available national teen smoking rate. Guided by the belief that every life has equal value, the Bill & Melinda Gates Foundation works to help all people lead healthy, productive lives. In developing countries, it focuses on improving people's health and giving them the chance to lift themselves out of hunger and extreme poverty. In the United States, it seeks to ensure that all people—especially those with the fewest resources—have access to the opportunities they need to succeed in school and life. Based in Seattle, the foundation is led by CEO Patty Stonesifer and co-chair William H. Gates Sr., under the direction of Bill and Melinda Gates and Warren Buffett.